The inevitable backlash against the LOLcat meme begins. Soon all the cool kids will be wearing LOLcat bites T-shirts. Remember you saw it here at Stonekettle Station first. Educated Dog disdains to comment. 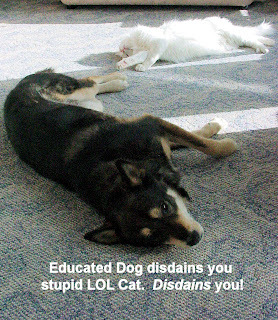 Update: Educated Dog now says the T-shirts should actually say "Neuter LOLCat." The management disdains to comment on that. It was the dog's idea. She's a wit, she is. Die, Miserable PDF Format, Die!